Americans in support of Michelle Obama to be the president – Kenyatta University TV (KUTV). All Rights Reserved. Her address continues to receive praise across the globe, and besides making the case for Hillary Clinton’s presidential candidacy, it aroused unexpected calls for her to run instead of Mrs. Clinton. The presidential race in America is one of the world’s most watched events from the onset.From the hotly contested campaigns in the 2008 elections, to the moment President Barrack Obama was inaugurated as the first black President of the global superpower in what is considered the most intense elections of its kind, America continues to draw attention both positive and negative from the rest of the world. This has escalated to present day when both Republican and Democrat sides of the country root for their favorite presidential candidates, Donald Trump and Hillary Clinton respectively. But, it is Michelle Obama who has stolen the spotlight from both Trump and Clinton. 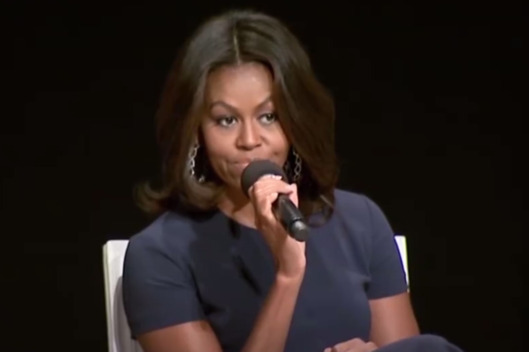 “Here in America, we don’t give in to our fears,” Michelle said, “We don’t build up walls to keep people out because we know that our greatness has always depended on contributions from people who were born elsewhere but sought out this country and made it their home.” This, she said during the commencement address she delivered in June at the City College in New York. Michelle’s speech during the Democratic National Convention on Monday night got the world talking and begging her to step in and take the presidency instead of Hillary Clinton.